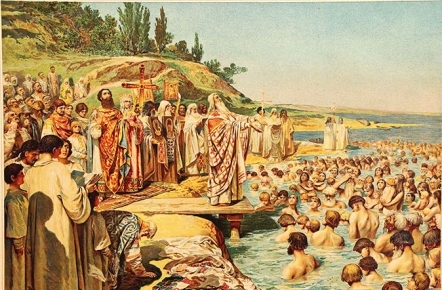 Moscow, March 22, Interfax - A quarter of Russians count national history from the time of Kievan Rus (26% vs. 19% in 2003), while 12% believe that Russia's history started with the Christianization of Kievan Rus, the Levada Center public opinion service told Interfax. Another 7% maintain that the formation of Russian principalities marked the beginning of the country, 5% count national history from Peter the Great, and 3% use the October 1917 Revolution as the reference point. Two percent each believe that Russia’s history started with the formation of the Grand Duchy of Moscow, the collapse of the Soviet Union, the establishment of the sovereign Russian Federation in 1991, or the election of Vladimir Putin for president, and one percent of those polled believe the adoption of the Declaration of the Russian Federation’s Sovereignty in 1990 was the event with which Russia began. Some 36% opined that national history had been evolving “since time immemorial, since the beginning of time” when they were asked which date, epoch or event was at the outset of Russia’s history. Asked which periods of national history were of particular interest to them, some 38% of the respondents mentioned the 1941-1945 Great Patriotic War, 31% referred to the Peter the Great epoch (the 18th century), and 28% to Ancient Rus (the 8th to the 17th centuries). The rest were interested in the late 19th century – early 20th century (18%), the Brezhnev epoch of the 1970s – 1980s (17%), and the 19th century (14%). Another 15% percent of the 1,600 respondents polled in 137 populated localities in 48 regions on March 2-6 said they did not care about any period of Russia’s past.